Let me first deal with a potential conflict of interest. Tim has a wide twitter following, and quite often tweets a reference to my blog posts. This might lay me open to the charge that I would be inclined to favourably review his new book to return this favour. Actually it has the opposite implication. The fact that he finds my blog interesting simply shows he appreciates good macroeconomics, which is just as well for someone who has just written a book about the subject. What it does mean is that if I had found anything in his book which I had clearly shown to be fallacious in one of my posts, I would be doubly disappointed. Ah, that reminds me of the second thing I should say at the start. The book employs the dialogue format that Tim uses in his FT columns so well. This is more unusual in a book and might potentially bother some, although most of the time it is used much more sparingly than in the columns. Otherwise it is written in just the same style that makes his other books so readable. Yes, but microeconomics and the other subjects he has written about before are potentially interesting. This book is all about macroeconomics: yawn, yawn. Indeed. Up until now it was unclear whether it was possible to write a general explanatory (rather than specifically topical) book on macro that did not have the eyelids dropping after a few chapters, or which began to stretch the reader quite quickly. 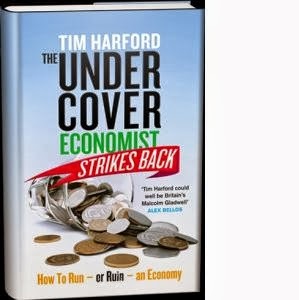 Given Tim’s ability to write about economics in an engaging way, with this book he could settle the matter one way or another. Now in one sense I’m probably not the best judge, given my prior knowledge, but it seems to me Tim has pulled it off. Oh come on. How can you make understanding Keynesian economics enjoyable? With a mixture of stories about economists of the past, and lots of useful analogies and examples. So, not surprisingly, Bill Phillips and his machine play a major role, as do shortages of ‘money’ in baby sitting circles and Iphones when discussing price stickiness. Some I knew about, but others (like Henry Ford’s application of efficiency wages) I had forgotten about. But I bet it is highly selective in the stuff it covers. All the juicy topical issues, but nothing on RBC models or how you measure GDP. Hmm, very amusing, but hardly the neutral account you might find in a textbook. Which means Tim is not afraid to occasionally call it how he sees it. For example you will find the equivalent of the standard discussion of the optimal rate of inflation early on, but Tim makes it pretty clear he thinks raising inflation targets above 2% would be a good idea. You will also not find any equations in this book, but it does cover much of the same ground as a textbook. Which means macroeconomists will not be adopting this book as their set text then! That is not the market he is aiming for. It is ideal for the interested non-economist who wants to understand something of macroeconomics in an easy and enjoyable way. However I also think it is a great supplement to the textbooks for students. All too often, students reading textbooks focus on the formalism, and fail to understand the key concepts, or relate them to the real world. Tim’s book is an excellent antidote to that. And last but not least, it provides a wealth of material for academics to make those lectures much more fun for students. Absolutely, although I’m still not sure about that dialogue style. OK, I know that those more seasoned in trying to present simple economic ideas in a politicised environment know this happens all the time. And damn it I knew it was going to happen too, as I clearly predicted in one of my early posts. But still, despite my attempts to mock, the argument that positive growth proves critics of austerity wrong continues to annoy me. So here is my attempt to say why it bothers me so much, but after this post I really will try to move on. Just in case you have not been convinced by my earlier posts of just how ludicrous this argument is, think about this. US growth became significantly positive at the end of 2009, and has remained so in nearly every quarter since then. So if positive growth proves critics of austerity are wrong, then the austerity debate in the US would be well and truly dead by now. Those that refused to admit this would be completely ignored. Yet the opposite is true. So the amazing thing is how the idea that the emergence of growth after years of stagnation proves austerity was just fine could gain a moments traction. Do not get me wrong. There are some arguments in favour of austerity that should be seriously debated. But this is not one of them. Instead the argument is just silly. So how can people get away with making it? The first point to make is that although the argument is obviously silly to anyone with a modicum of macroeconomic knowledge, to interested people without that knowledge, but who get to listen to (or even interview) people like George Osborne, it is not immediately obvious. It becomes pretty obvious once it is explained (my example of deliberately shutting down part of the economy was designed with that in mind), but you need to be exposed to someone who can explain that. So, for those just interested in scoring political points, there is a temptation to make the argument if they think they can get away with it. However I do not think that excuses George Osborne, or European politicians who have done the same for the Eurozone. We may pretend to believe that all politicians lie through their teeth all the time, but actually we do expect people like the UK or German finance ministers to avoid talking economic nonsense. At the very least we expect their civil servants to stop them saying things that are nonsense. Well not this time. But there are limits to what politicians can get away with. The interesting question is what those limits are, and what governs those limits. Sometimes politicians can get away with bad arguments because they are based on half truths. The example that comes to mind is the idea that current austerity is required because of fiscal profligacy on the part of the past Labour government. While that myth annoys me because (a) it is used to support a damaging policy, and (b) because having crunched the numbers I know it’s untrue, the existence of the myth does not surprise me in the same way. As I have said before, the half truth here is that Gordon Brown was a little imprudent by being overoptimistic about tax receipts. Furthermore, if he had known in advance that the global financial sector was going to blow up he would have been much more cautious before that happened, so any data that is by construction wise after the event will suggest he was not cautious enough. This all means that for those who want to mislead there is the seed corn with which to grow this myth. Nothing like this is true for the ‘growth proves austerity right’ idea. Instead it is an example of completely misrepresenting the argument of your opponent. The overwhelming majority (maybe all) of the economists who criticised austerity said that fiscal contraction would reduce the level of output in the short run. They may also have been concerned that this short run deflation might have negative longer term consequences. The deception is to morph that into ‘critics of austerity said that the economy would never grow again as long as austerity lasted’. Now I’m sure you could find some person (call them X) who was foolish enough to say the economy would never grow while austerity lasted. But everyone knows that Paul Krugman, or Brad DeLong, or Jonathan Portes are not X. Yet those making the ‘growth proves austerity right’ argument deliberately talk as if all critics of austerity were like X. It is a deliberate deception. It must be particularly galling for Martin Wolf to find his own newspaper doing this to him. Economists whose job involves communicating with others, and media organisations that purport to have some economic expertise, have I believe the equivalent of a duty of care. It is their job to make sure people are not misled by arguments that they know are obviously wrong. What makes me cross is seeing some who choose not to exercise this duty of care. Let me use an analogy. You are a science reporter for a newspaper, or even a reporter working for a magazine like the New Scientist or Scientific American. You have to comment on a politician who claims that because it snowed a lot this winter, climate change is clearly rubbish. What you would do in those circumstances is patiently explain why the politician was talking nonsense, discussing trends and noise and the like. You would not say as a prelude that the politician ‘makes a serious case’. You would certainly not write a leader in your paper saying the politician was absolutely right! Just imagine it. A leader in the New Scientist or Scientific American saying that politicians have won the climate change argument because of recent heavy snow. So why is that idea inconceivable, but a leader in the Financial Times saying that recent UK growth proves critics of austerity are wrong goes without comment? It has nothing to do with economists being divided about the wisdom of austerity: as I said, there are arguments on austerity that should be debated, but this is not one of them. It cannot be because austerity is so politicised, because climate change is also highly politicised. It cannot be excused by saying that leaders are just opinions: you do not expect opinions in serious newspapers to be based on deliberate misrepresentation. So what is going on here? Would anyone from the FT care to comment? As I was about to post this I saw Paul Krugman had (typically!) got there first, but I think I slightly prefer my version so I’ll post it nevertheless. Once upon a time there was a land governed by a king. The land was productive, with many small firms making all sorts of goods. But recently the land had suffered a mysterious misfortunate: some of the businesses had closed, and some people were looking for work. The king was a superstitious man. In particular, he believed there were good letters, and bad letters. He thought the letter G was particularly bad. So one day he told his courtiers that he had decided what the problem with his land was. Its ills were caused by owners of firms whose name began with the letter G. They were bringing bad luck to the economy as a whole. So he ordered all firms owned by people whose name began with the letter G to close down. Now some advised the king against this action. While they did not dispute that G might indeed be an unlucky letter, they felt that closing down any firms while the economy was already weak was not a wise policy. The king was not pleased, and ordered that these advisers be locked up. So the king’s policy began to be implemented. Now many firms were owned by people whose name began with the letter G, and as the king’s policy was implemented further woe came to his land. The amount produced in the land declined further, and those working for the firms that had been closed became unemployed, and so had less money to spend. But his loyal courtiers proclaimed that this had nothing to do with the king’s order, but was the result of a fall in demand from overseas for the economy’s products. There was some truth in that, because some other countries had chosen to follow the king’s example and also close down firms whose owner’s name began with G.
Unrest in the country grew, and the king became unpopular. His loyal courtiers became concerned that the king could be overthrown. So they quietly slowed down the process of closing down the businesses whose owners names began with G. At the same time, some of those who used to work for firms that the king had ordered closed found work with other firms, and these other firms expanded their output. It is rumoured that some people also changed their name to something not beginning with G, and reopened their old businesses. So the economy began to recover, and output growth was positive again. So it came to pass that the courtiers now hailed the wisdom of their king. The economy had been purged of the letter G, and was now clearly healthier as a result. The original critics of his policy had been shown to be wrong, and the king doubled their jail terms. Newspapers throughout the land proclaimed their king’s wisdom. Knowing no better, the people reaffirmed their devotion to the king. At which point the king said that he never much liked the letter H either. Will the UK Conservatives become like the Republican Party? It is probably no exaggeration to say that most people within European countries view the US Republican Party with a mixture of amusement and horror. It is largely why the vast majority of Europeans supported Obama in the last election. I think a major reason for this is the attitude of so many in the GOP to science. Most Europeans do not know whether to laugh or cry when half the Republican candidates for President appear to reject the theory of evolution. The theory of evolution may not be a hot topic in Europe, but that does not mean we are immune to the same tendencies that created today’s Republican Party. I would argue that attitudes to climate change represent an acid test of whether ideology has overtaken evidence in parties of the right. The UK in particular appears to be at a critical point in this respect. While the official Conservative line recognises the importance of trying to deal with man-made climate change, a significant proportion of Conservative MPs are now promoting climate change denial. Deniers are given wide coverage (and often support) in the largely right wing UK press, and perhaps as a result the UK Chancellor, George Osborne, has been quite antagonistic towards ‘green’ policies. The hypothesis of man-made climate change does not have quite the same scientific status as the theory of evolution. The consensus of scientists on climate change is overwhelming and impressive – as the latest IPCC report makes clear – but the nature of the problem means that uncertainties will remain huge. I have had conversations with some in my own institution who express scepticism. However I have yet to talk to any scientist who is so sure of their scepticism that they would argue against taking a precautionary view, which means taking action now. Climate change denial (the position that we should effectively ignore the problem) is almost exclusively found on the political right, which surely suggests that views are being governed by something other than an objective appraisal of the science. This is clearly important in its own right. But I think it must also be an indicator of how far a party is prepared to disregard evidence in pursuit of ideological goals. Allow something as important as climate change to be decided on quite misplaced ideological grounds instead of the evidence, and what area of policy will be safe from similar treatment? I suspect many may think I’m going over the top here. The Conservatives becoming like the Republicans – don’t be silly. The fight in the UK is all about capturing the centre ground, surely? But if that is what you believe, I would ask how much hard evidence you have for that view? Of course the Conservative Party cannot be openly seen to be becoming like the Republicans, because of the observation I started this post with. So there are one or two issues – Gay Marriage, support for foreign aid – where Cameron can say he is facing down his right wing. But on virtually every other major issue, the question is whether current policy will just duplicate the shifts created by Margaret Thatcher (e.g. in increasing poverty) or go beyond it (e.g. in reducing the role of the state). The modus operandi for most political commentators is that the main parties locate themselves just to one side of an immovable centre ground, but we know that has not been true in the past, so why should it be so now? I once wrote a post that tried to suggest one reason for US exceptionalism: the lack of a state controlled TV, and the absence of any restrictions of the political positions that TV companies can promote. In the UK, for example, I argued that the existence of the BBC tended to emphasise centrist views, and come down quite hard on political extremes. While I think there is something in that argument, I now suspect I was a little too sanguine about its importance for two linked reasons. First, if crazy ideas like climate change denial can infiltrate their way into one of the mainstream political parties, and these ideas are supported by large sections of the press, then the BBC becomes conflicted between staying with the science or being ‘balanced’ in political terms. Second, if the right wing party is in power, it can apply financial pressure on the BBC to go for balance rather than go with the evidence. We are seeing exactly that happen now in the BBC’s reporting of climate change. The BBC does recognise the issue, but may not have the ability to impose a solution. I think this should worry anyone who believes in evidence based policymaking. The danger for those on the right is a belief that this process can be managed and controlled, so that the actual influence of crazy ideas on policy is marginal. Both the example of the Republican Party, and Cameron’s attempts to appease those on the right of his own party and UKIP voters, show the view that the establishment will always prevail is naive. So what can the Conservative Party, and other centre right parties in Europe, do to prevent them becoming like the Republican Party in the US? In the 1980s in the UK, the Labour Party faced a similar problem. The solution that emerged was to make a virtue of attacking those further to the left, and the values they upheld. The repeal of clause IV from the party’s constitution was a classic example. However there is a key difference: New Labour never faced a serious electoral threat from disaffected Old Labour voters, and those further to the left never had any support in the media. In contrast, Cameron has UKIP and an extreme right wing press to contend with. (I suggest here that the two problems are linked). So in his case standing up to his right wing could be an immediate electoral liability, which is why he has until now been more likely to appease than oppose. The pessimistic conclusion for those who believe in evidence based policy may be that there is nothing that can stop the Republicanisation of the UK Conservative Party. What shall we tell our students (Financial Times Edition)? In a tutorial somewhere in Oxford, where students are about to start a new year, having just finished learning the macro part of first year Principles. Q: Before we start, can I ask you a question about the macro we learnt last year? Q: In the basic model, if interest rates stay constant, a fiscal contraction reduces demand and output in the short run, right. And governments around the world, including the UK, have been tightening fiscal policy because debt is too high. So they will reduce output in the short run, making the recession worse? A: That is right. Their argument would be that they have to do this, because the costs of allowing debt to rise are greater. Their critics say that, at least for countries with their own central bank where there is no funding crisis, this risk from higher debt is virtually non-existent. Q: But over the summer the UK economy has started to recover, and George Osborne says that this proves that his critics are wrong. A: Well he would say that, wouldn't he? But the important thing is that you understand the macroeconomic analysis, and not get distracted by what politicians may claim. Q: But you also told us at the start of the course that we should read the Financial Times to get an informed view of current economic developments. A: I do remember that, yes. Q: In their leader of 10th September 2013, the headline is “Osborne wins the battle on austerity”. So the ‘informed view’ is that George Osborne is right, and the recovery does prove his critics are wrong. A: Are you sure that is what the editorial says? A: But it then surely goes on to say that a recovery is quite consistent with the critics who said austerity would reduce output in the short term? Q: No, it basically says the recovery shows Osborne is right and his critics are wrong. A: Hmm, that is odd. Let’s think what the basic model says. Fiscal contraction will reduce output in the short run. But what happens in the longer term? Q: Well, in the medium run output is determined from the supply side. So as long as the economy is not hysterical and the recession does not affect supply then fiscal contraction will not influence output in the medium term. A: It’s hysteresis, but otherwise yes. So what must that mean for economic growth once the ‘short run’ is over? Q: Well, if the medium term level of output is unaffected by fiscal contraction, but output in the short run is lower, then that must mean output growth will subsequently be higher than it would have been without fiscal contraction. A: Quite. And what do we know about how the UK economy had been doing in the years before the recovery began? Q: I think it was the longest ever UK recession, with UK output hardly increasing since 2010. Unemployment stayed high, and living standards have taken a big hit. A: Except maybe not for FT leader writers. So everything has been entirely consistent with the basic model, and with what critics of austerity who used basic macro said would happen. A: To be honest, I’ve no idea what that means. But I can tell you that the empirical evidence that fiscal multipliers are positive is overwhelming, and also that they are larger when monetary policy finds it difficult to offset the impact of fiscal policy. Did the editorial not mention this? Q: Nope. Instead it says “What we do know, however, is that the chancellor’s critics overstated the obstacles standing in the way of a recovery. Their position was too extreme and they have found themselves snookered.” So who were these critics? A: I have no idea, but I doubt they were academic economists, who would obviously know about the basic textbook model you have been taught. I must say this editorial looks more like something that was drafted by one of George Osborne’s speech writers than anything written by a journalist with an economics training. Q: Perhaps the FT does not believe in the textbook model you have taught us? A: That would surprise me a lot. The model has been taught to students for half a century, and is accepted by the clear majority of academics. It is what central banks use when they try and stabilise the economy. It would be odd if the world’s top financial newspaper started taking a different view. Q: So should we still be reading the Financial Times to get an informed view of current economic developments? Perhaps we should be reading editorials in the Wall Street Journal instead? A: Oh god no! But I shall clearly have to reconsider my advice. Perhaps it’s time to try something else. I’ve heard there are quite a few good economics blogs these days. A holiday means that I’m late commenting on George Osborne’s 9th September speech, but I cannot let it pass. It attempts to show that those, like me, who oppose the government’s austerity policy, have lost the argument. As exactly the reverse is true, I need to show where his analysis is wrong. Actually that is quite easy, because there is no coherent analysis, just a series of sound bites. I’ll begin with the section which starts ‘the headline facts are not in dispute’. There follows a highly selective and misleading set of facts. I could retaliate in kind, but instead here is a chart from economists at the Bank of England, who should be objective in their selection of data. 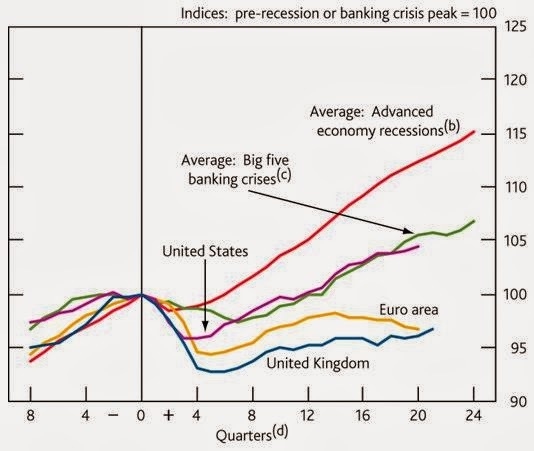 It shows that the UK recovery has been weaker than is normal even allowing for the fact that the recession was caused by a banking crisis. The only area that has done as badly as the UK is the Eurozone. This is a dismal record, given the unique problems faced by many Eurozone periphery countries. They really did have a government funding crisis, whereas the UK just acted as if it had one. Not surprisingly, Osborne chooses to focus on employment rather than output. As everything that is relatively good about UK employment is equivalently bad about UK productivity, this just emphasises how appalling the record since 2010 has been. The irony of all this, as Jonathan Portes points out, is that the pace of fiscal consolidation in the UK has recently slowed compared to the first two years of this administration. (According to the latest estimates from the OECD, the underlying primary fiscal deficit, after shrinking sharply in 2010 and 2011, actually rose in 2012.) So the simple implication would be: ease off on austerity, and you allow a recovery to begin. Jonathan says “we should give the government credit for not digging us further into a hole by trying to stick to its original plans.” I might be inclined to agree if they were being honest about what they were doing. Instead we have this Orwellian world were the Chancellor says we have a recovery because he stuck to his plans, when it appears exactly the opposite is true. There is no attempt in the Chancellor’s speech to address the academic estimates of the amount of UK output lost through austerity, such as those of Oscar Jorda and Alan Taylor discussed here. No attempt to look at how monetary and fiscal policy interaction is changed at the zero lower bound – perhaps because the UK Chancellor is also ultimately responsible for the monetary framework. I also see (HT Alan Taylor) that Mark Carney confirmed to the Treasury Select Committee that fiscal policy had been a drag on growth. It would be interesting to know by how much according to the Bank’s model. But the Chancellor knows he does not need to address these arguments. Instead, if he keeps on repeating that rapid growth shows critics of austerity are wrong, he will get away with it. Just as he has with the myth that much of our current problems are down to the fiscal profligacy of the previous government. Most of the press will parrot his arguments (even those that really should know better ). Any hope that the BBC might provide some objectivity have disappeared as a result of threats and intimidation. So Stephanie Flanders writes: “As ever, there is no black and white here, but Mr Osborne's speech makes a serious case.” I guess this is the same sense of ‘serious’ as in Very Serious Person. This will all mean that the public will never find out that many of the minority of UK academics that originally supported austerity have changed their minds, that it is difficult to find prominent academic macroeconomists currently supporting austerity, and that more widely the academic argument for austerity has been decisively lost. Unfortunately, as Paul Krugman suggests, there is evidence that this strategy of initially closing down parts of the economy so you can claim credit when it starts up again can help win elections. All very depressing, although also rather predictable. If he was being honest, he would say that the issue is how many percentage points of GDP have been lost as a result of his additional austerity. Are the multipliers low, as the OBR suggest, or higher, as the IMF and others suggest. By instead referring to a baseline of the OBR forecasts which already embodied their low multiplier estimates, he simply (but deliberately) muddles the issue. In traditional business cycle theory, the economy always returns to a level of activity that is independent of the depth of a demand led recession. So if you increase the depth of the recession through austerity, you automatically increase the strength of the recovery. This will be true even if austerity is ongoing, because private sector demand does eventually replace public sector demand in this standard model. The sound bite about monetary policy activism is repeated, with no reference to the zero lower bound. There is a statement about how “economic theory and academic evidence both suggest that multipliers are likely to be relatively low in an open economy with a floating exchange rate and independent monetary policy”, with no acknowledgement that an independent monetary policy may be of limited use at the zero lower bound. I am not sure which is worse here: Osborne because he has power, or the FT editorial page because it should have no political axe to grind. But really, you would hope an FT editorial would contain at least some economics to back up the rhetoric. It is not the stuff of headlines, but Ed Balls conference speech contained an interesting idea for extending the remit of the Office for Budget Responsibility (OBR). Although this could in theory have major implications for the 2015 debate on UK fiscal policy, I suspect in practice it will not. But first some background. In the year after the 2010 election, the new government relentlessly plugged the line that Labour’s past fiscal profligacy was central to the need for current austerity. It was a smart line to push, so it didn’t worry those making it that it was not true. I’ve documented the facts in a peer reviewed article, in various blog posts, in a debate with Jeremy Warner (follow links back from here), and elsewhere. I have no political interest in pursuing this point, beyond a perhaps naive belief that evidence should not be distorted for political ends. Preoccupied with electing a new leader, Labour did little to counteract the myth at the time. Whether they could have done anything in the face of a largely right wing press I do not know, but the result had two key negative consequences. First, there was no effective political opposition to austerity. Second, Labour or its supporters fell over themselves any time they were asked whether their proposals might lead to additional borrowing. It is also clear that the government will return to this line of attack in the next election, meeting any policy proposal that involves spending money with the accusation that this signifies a return to Labour’s profligate ways. The OBR is a ‘fiscal council’ or ‘independent fiscal institution’ established by the current government, of which there are now many international examples. (Calmfors and Wren-Lewis analyse in detail eleven that existed in 2011.) The two most longstanding are the CBO in the US and the CPB in the Netherlands. Both these institutions can cost opposition as well as government fiscal plans, if they are requested to do so, although the CPB approach appears less open to political game playing than the CBOs. The OBR has a much more restricted remit: it can only cost the governments announced fiscal plans. Ed Balls will ask the OBR to cost the fiscal proposals it puts to the electorate in the 2015 election. If the OBR did this, this would either expose Labour’s dodgy fiscal arithmetic, or deflate claims their proposals were not properly costed. As Labour would do its utmost to prevent the former, this looks like a smart move politically. I also think it would improve the level of the macroeconomic debate, which is why I have often suggested the OBR might be given this role. So Labour will not be able to say that its plans have been costed by the OBR, but only that it is happy for the OBR to do this. As it knows this offer will not be taken up, its political force appears weak. I cannot help but remark that this shows how foolish Labour was in government to reject the idea of a fiscal council. If they had created a fiscal council with wider powers than the current OBR, they would be in a much stronger position now. In practice, therefore, anyone seeking the facts on the fiscal plans of the opposition during the election will have to turn to the expertise at the widely respected Institute of Fiscal Studies (IFS). So for 2015, not much will change. But in the longer term the momentum for extending the OBR’s remit is building, which I regard as a very positive development. There is the old joke that there are just two kinds of people in the world, those who think there are two kinds of people and those who don't. The trouble with following an ideology is that you tend to make this ‘with us or against us’ division on what is seen as fundamental. In these terms I am a non-person, because I have no idea what the ideal size of the state should be (although I suspect within an ideology that defines itself by the virtues of a small state that makes me ‘one of them’). For me the intellectual case against austerity has nothing to do with the size of the state. The key argument I and others are making for those who want a smaller state is that it is folly to try to achieve it in a recession when interest rates are at the zero lower bound. The problem for ‘small state people’ like Warner is that “there is never any appetite for it in the good times”. I can only interpret this as meaning that in good times people appear to be quite content with the size of the state they have, and will not elect a government which aims to reduce the size of the state. So why are things different in a crisis? Do people’s preferences over the size of the state relative to GDP really change when we are in recession? Or could it be that in the current crisis people are told that government debt is ‘out of control’, and that a reduction in government spending is necessary to bring the nation’s finances to order. Cuts in government spending are being justified by the need to reduce debt and not because of the virtues of a small state. Reducing the size of the state temporarily to reduce debt, and reducing it permanently are rather different things. There is apparently no appetite for the latter, so why not push for the former as a way of achieving the latter? As a political ruse it sounds very clever, and it is currently working in the Eurozone, US and UK. But it remains a ruse: a giant deception played on electorates across the globe. So no wonder Jeremy Warner is tired of the austerity debate. As he says “if you attempt to rip big chunks of government demand out of the economy, it is bound to have negative short term consequences.” Seeing the government you support trying to avoid making this admission must be painful. It would have been much more honest to say that the loss of output was worth it for the long term benefits that a small state would (allegedly) bring, but that is not the argument that governments are making – instead it was all about a ‘debt crisis’. This becomes even more painful when the intellectual basis for the debt crisis argument falls away. Surely this deception is scandalous. The Telegraph played a major role in the MPs expenses affair. Many UK MPs had been overinflating their expenses because they believed their salaries were unjustifiably low because the public never had the appetite to increase them. So the end justified the means. The Telegraph quite rightly exposed this practice, and those MPs were held to account. Yet in financial terms the cost of the austerity deception is infinitely greater. To some the end (a smaller state) justifies both the cost (percentages of output lost) and the means (telling people it is all about a debt crisis). Yet it involves deceiving electorates around the world, which is why no government politician is ever going to be as honest as Jeremy Warner has been. So by way of introduction to the main topic of this post, let me sound off about one silly thing which I have heard from good UK journalists recently, following the strong Q2 growth figures. I will not single anyone out, but here is a typical example: “The argument that fiscal austerity would lead to deep recession or permanent stagnation has proved false.” This is a classic rhetorical device: take one side of an existing argument, distort it so that it becomes much more extreme, and then claim that as this extreme version is obviously wrong the argument in general is false. The problem with the sentence above is that it can so easily be read as: recent growth shows critics of austerity were wrong. As far as I know, no reputable economist has argued that austerity would mean the economy would never start growing again. In terms of basic theory, that would be a crazy thing to do. In a demand led recession, austerity reduces the level of output from what it otherwise might have been. In the simplest case, once we come out of recession output goes back to the level it would have been without austerity. (There is no long term impact on supply.) So austerity leads to some years where growth is less than it would have been otherwise, followed by later years where growth is more than it would have been otherwise. As I have pointed out before in the context of discussing the Latvian experience, we could close down half the economy for a year. The next year economic growth would be fantastic. Only a fool would argue that this showed that closing down half the economy for a year was a great idea. There is a quite powerful argument that austerity has additional longer term costs, besides the lost output during the recession, because of hysteresis effects. That argument would be disproved if the recession left no permanent scar, which we would only know if output returned to its pre-recession trend. Again rapid growth as we begin to come out of the recession gives us no information on this. Unfortunately journalists live in the world of now, and so confusing levels and growth in this way is easy to do. Which brings me to a recent debate in the UK about whether the opposition is right to switch its criticism of the government to focus on the decline in living standards since the last election. It is generally accepted that complaining about fiscal consolidation being ‘too far, too fast’ has limited traction when the government has successfully implanted the false idea that austerity is required because the previous government was profligate. It could and should focus on the level of unemployment, but one of the features of the UK recession is that its impact has fallen on real wages as well as unemployment. So it seems to me both fair and logical that Labour should focus on living standards as a way of re-expressing the ‘too far, too fast’ idea. Like Duncan Weldon here, I cannot really see why people like Hopi Sen or Chris Dillow have a problem with this. It is just another way of saying that austerity in a recession is a bad idea, but with the advantage that it is one step removed from the Labour profligacy myth, and it provides an effective counter to the ‘look the economy is growing - didn’t we do well’ line. One good way of knowing that you are on to a good thing is when the other side starts looking worried. So we are beginning to see the idea being discussed that slow growth in UK wages is all about the decline of the West in the face of the emergent East, or some inevitable decline in technical progress. Both are interesting ideas, but I do not think anyone would seriously argue that they explain more than a fragment of the recent stagnation in UK real wages. I’m not sure anybody has a complete explanation for this stagnation, but austerity has clearly played its part, so it is absolutely appropriate for the opposition to focus on low real wages. Indeed, they would be crazy not to. Hopi Sen also worries that Labour’s response to ‘what would you do about it’ is just a series of pretty small scale measures. At the rhetorical level I see the problem. However at the intellectual level I am a bit less concerned. The Conservative Party campaigned in the last election on a macro programme that promised to do great harm, and kept to that promise. So promising to do not very much would be an improvement! In addition, I suspect good policy is often made up of a large number of small measures. It would be nice, however, if there were some consistent themes that motivated those small measures, and I might have some more to say on this later. The platform I use for this blog gives my ‘pageviews by country’. One surprise is that, using this criteria, the country which comes third in the list, after the US and UK respectively, is France. (Over the last month, for example, about 12,000 pageviews compared to about 36,000 in the UK and around double that in the US, with a whole group of countries below France at around 5,000.) This is really nice, particularly as I have only once written a post specifically about France, over a year and a half ago. So a recent post by Ronald Janssen in the Social Europe Journal allows me to make up for that. First some background if you do not live there. France is subject to the Fiscal Compact’s 3% budget deficit target like everyone else in the Eurozone. European Commissioner Olli Rehn is the chief enforcer of these rules. In May the Commission granted France, along with a few other countries, 2 years grace before they needed to achieve that target. The Netherlands was given only one year, with consequences I talked about most recently here. The chart below shows OECD numbers and forecasts for various fiscal measures in France. The financial balance relates to the 3% target. The underlying balance essentially cyclically adjusts this. As you can see, the key reason that France is not meeting the 3% target is depressed output. The OECD estimates the output gap in 2013 will be nearly -4%, rising in magnitude to -4.5% in 2014. The underlying primary balance is the best indicator of what government policy is doing: fiscal policy has been tightening ever since a sharp expansion following the 2008/9 recession. So far, so typical of the Eurozone and elsewhere. However what makes France relatively unusual is the pattern of this tightening. As the IMF clearly showed in analysis I discussed here, it has achieved this fiscal contraction entirely through tax increases rather than spending cuts. The first best thing to do, of course, is to delay fiscal tightening until the output gap has closed. The Eurozone’s fiscal rules will not allow that, and instead in the current context encourage pro-cyclical fiscal policy. I have never met a macroeconomist who advocated pro-cyclical fiscal policy, but of course those behind the Fiscal Compact know best. If you have to follow the Fiscal Compact, then I have always argued from the point of view of doing least damage to the economy in a recession any temporary fiscal tightening should focus more on tax increases than spending cuts. You might, for example, try to meet the Fiscal Compact rules in the short term through temporary tax hikes, and follow with more permanent spending cuts and/or tax increases once the economy recovers. To a first approximation that appears to be what the left wing government in France is trying to do (most notoriously by temporary increases in the top tax rate). My argument has always been based on straightforward macroeconomic theory, but as Ronald Janssen points out in his post, this is fully supported by recent IMF empirical work. It is therefore entirely predictable that European Commissioner Olli Rehn should take completely the opposite point of view. He is quoted as saying that new taxes would “destroy growth and handicap the creation of jobs." “Budgetary discipline must come from a reduction in public spending and not from new taxes,” he added. Now I'm not sure whether that counts as advice or instruction: within the Eurozone it is increasingly difficult to tell. I suppose you could argue that Rehn’s concern is more about the longer term size of the French state, and that his obvious belief that the French state is too big comes purely from worries about the implications for macroeconomic performance. But what struck me was simply this. In the election of April 2012 the French people elected a left wing government that had a clear platform of achieving fiscal consolidation partly through tax increases. Even if the Commissioner thinks that is a foolish thing to do, that is their choice. It is one thing to have a set of fiscal rules that focus on overall budget deficits: however misguided those rules may be, the French government did agree to them. What I do not think any Eurozone government signed up to was having the Commission tell them what the size of their own state should be. With these remarks, together with its insistence that various Eurozone countries undertake certain ‘reforms’, the Commission appears to be doing its best to create a de facto fiscal union. The only problem, of course, is that the French did not elect Olli Rehn.